I have two grandchildren aged seven and ten. That means that they have outgrown the hallowed days of buckets and spades and afternoon naps and walks in the pineta but do not yet spend their time horizontally texting their friends and listening to heavy metal. So what do you do to combat the bête noire of every parent and grandparent – the tablets and gameboy? Our beach is now pronounced boring so my son takes them to the Bagno Delfino in Marina di Cecina where they can windsurf, sup (stand up paddle), kite surf, rent boats and pedalo’ and jump off the blow-up trampoline. There are rocks where you can snorkel, while instant refreshments are available at a bar and a restaurant only a flip flop away. Twice a week they go to Baratti (barattidiving.it) where Tania and her husband offer courses from beginner to open water diving certificates in scuba diving. Baratti also has one of the most beautiful beaches in the area and if you ask for Andrea at the marina he will take you by boat to little hidden coves and rocky beaches round the coastline. You can also rent zodiacs yourselves without needing a permit and go off exploring on your own. Another hot tip might be (weather and available space permitting) to take the children fishing at dawn with the owners of the El Faro restaurant in Marina di Cecina. Later on you can eat the catch of the day at this charming restaurant sitting on the terrace by the beach. Where to take them when they have seen the Tower of Pisa more than once ? The medieval Mines of San Silvestro between Campiglia and San Vicenzo are a big thrill for children, with a little train taking them all over the area, along the old mine tracks and tunnels. Meanwhile the tourist office in Sassetta organizes trekking on foot, horseback or bikes through the 700 acres of chestnut groves and Mediterranean scrub six hundred metres above sea level. A must do is a visit to the Oasis of Bolgheri (www.wwf.it/oasi/toscana/paduledibolgheri) which organizes evening tours from 6 p.m. until eleven o’clock at night when children can watch from little hideouts of bamboo the wild life nesting and summering in the everglade-like wetlands and among the reeds in the marshland behind the dunes. Of course, the favourite food is pizza and the best pizza comes from Naples. 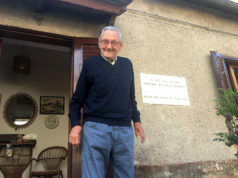 Ciro is Neapolitan and his restaurant is in the localita Olmaia in Marina di Castagneto. My name is Pedro and I am ten years old. Not that I don’t like buckets and spades 100%, more like 60%. I like walking along the beach because it gives me happy thoughts that remind me of things I did as a small child. Now that I am ten I am more interested in wind surfing, scuba diving and aquatic sports which we can do at the beach in Cecina. 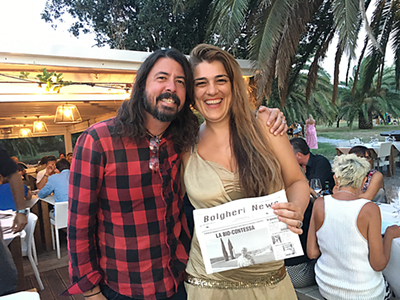 I have been coming to Bolgheri since I was a baby and what I like is that when you go to the bar you have the opportunity to meet your friends, like my friend Manuel, who I have known since I was five. I love Bolgheri because all over the countryside you find sparkles – like kind people.